On 25th of May 2018 the new General Data Protection Regulations (GDPR) will come into force. EU GDPR is the most important change regarding data privacy in over 20 years, causing all web data controllers and processors to re-consider how they manage, store, and transmit user data. As many other web applications, Google Analytics is subject to these new regulations. Since Google Analytics Dashboard for WP (GADWP) is one of the most popular Google Analytics solutions for WordPress, in this documentation page we will try to guide you through some essential privacy features available on GADWP and some Google Analytics aspects. You may find these useful while preparing for GDPR compliance or other user privacy regulations. Please note that professional legal advice should always prevail any of the followings and that the information contained within this guide does not constitute and should not be taken as legal advice. If you’re interested in specific details regarding GDPR or GDPR in general, we highly recommend visiting www.eugdpr.org. The FAQ section of the above mentioned website would be a pretty good starting point. By default, the GADWP plugin doesn’t send this type of data to Google. If you customized the plugin or have extended its functionality to send any kind of personal information you should be aware that you are subject to account termination or data deletion. Personally identifiable information (PII) includes and is not limited to: names, social security numbers, email addresses, data that permanently identifies a particular device (such as a mobile phone’s unique device identifier if such an identifier cannot be reset), or similar data. In the following paragraphs we’ll describe features that are available on GADWP and which are related to data privacy. While Google Analytics is not revealing IP addresses on reports, this doesn’t mean the IPs are anonymized by default. Please note that DNT is not an industry standard, so certain browsers may not have this feature available. The plugin also provides a dedicated shortcode. You can use this shortcode to generate an opt-out button or link. 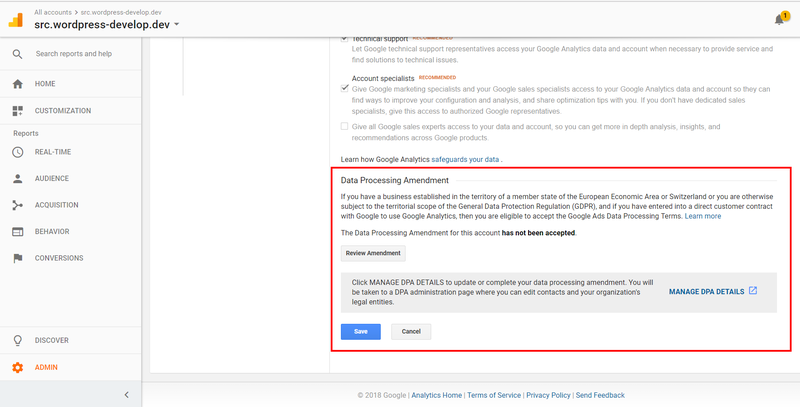 By clicking the generated button, users will be able to disable tracking with Google Analytics. If you omit the html_tag or use html_tag=”a”, an opt-out link will be created instead. While any idea and related feature suggestions are welcome, let’s not transform the comments in a GDPR or other regulation debate!